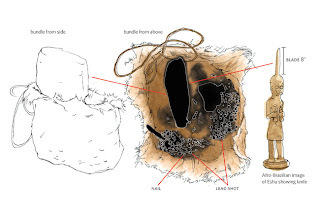 Schematic drawing of a clay “bundle” filled with about 300 pieces of metal and a stone axe. The object dates to 1700 and differs from religious caches previously found in Maryland. Archaeologists have discovered what they say is one of the earliest examples of traditional African religious artifacts in North America. Over the years of exploring the old houses and streets of Annapolis, Md., archaeologists have uncovered a trove of artifacts of early American slave culture. Among them are humble remains connected with religious practices, which bear the stamp of the slaves’ West African heritage. Early in the 18th century, as they were being baptized, African-Americans clung to “spirit practices” in rituals of healing and the invocation of ancestral and supernatural powers. Sometimes called black magic, these occult rites would persist in America in modified form, later, as voodoo and hoodoo. University of Maryland archaeologists have discovered in Annapolis what they say is one of the earliest examples of traditional African religious artifacts in North America. It is a clay “bundle,” roughly the size and shape of a football, filled with about 300 pieces of metal and a stone axe, whose blade sticks out of the clay, pointing skyward. The bundle, found in April and dated to 1700, appears to be a direct transplant of African religion into what is now the United States, said Mark P. Leone, a professor of anthropology at Maryland who directed the excavations. The materials and construction, he said, differed from the hoodoo caches his teams had previously found in Annapolis. In interviews last week, Dr. Leone and scholars of West African culture said they could not yet determine the bundle’s association with a specific religion or ethnic group. Frederick Lamp, curator of African art at the Yale University Art Gallery, who was not involved in the discovery, said there was “no reason to doubt” the bundle’s direct link to the long tradition of West African religious practices. “But bundles filled with materials seen to have extraordinary spiritual power were used by many different cultures in Africa,” he said. Dr. Lamp noted that X-rays of the bundle’s contents revealed an abundance of lead shot, iron nails and copper pins. “Some of the pins were bent, indicating this was a purposeful part of a ritual,” he said. Metal worked in fire was widely seen as having special power, Dr. Lamp added, “and combining these materials in compacted clay was believed to increase the power of these objects.” The practice, he said, is well documented to this day among the Mande groups, principally in what are now Sierra Leone, Guinea and Mali, and the Yoruba people of Nigeria and Benin. Nor should the Kongo people be ruled out as a source of these religious practices, scholars said. This culture, living in lands around the Congo River and in Angola and Cabinda, was a major source of African-American slaves. Kongo bundles contain stones, shells and other items that are supposed to hold the spirits of the dead for the use of the living in a custom that underlies hoodoo. The bundle’s most striking component, the stone axe, was especially intriguing. Dr. Lamp said this brought to mind the Yoruba and the Fon people of Benin, who considered the axe blade a symbol of Shango, their god of thunder and lightning. Matthew D. Cochran, a doctoral student in anthropology at University College London, who uncovered the bundle, said it would probably prove to be associated with Yoruba practices related to Shango. In the lands of coastal West Africa then, and in its rural areas still, these rituals and materials were used by community practitioners, whose role was akin to that of American Indian medicine men. They were not attached to any world religion, or any institution. But people went to them at small sanctuaries in the woods in time of grief and distress. The practitioners, with one of these bundles at hand, rallied spiritual forces to deal with personal crises. The Annapolis bundle, presumably made by a recent African immigrant, was excavated four feet below Fleet Street, which is near the Maryland Capitol and the waterfront. The object is 10 inches high, 6 inches wide and 4 inches thick. It remains intact, though an outer wrapping, probably of leather or cloth, has decayed, leaving an impression on the clay surface. The bundle is to go on display this week at the African American Museum in Annapolis. Mr. Cochran said that as he dug at the bottom of the trench, the object first appeared to be a flat stone embedded in sediment. Then he saw small bits of lead shot scattered about. As the archaeologists freed the lumpy mass, a corner cracked open, exposing the pins and nails inside. In the next week, the bundle was examined and X-rayed by experts under the direction of Dr. Leone. The bundle’s age, from the turn of the 18th century, or no later than 1720, was estimated from well-dated pottery shards found in the excavations. But how the object survived the centuries is a mystery, though its placement on what was then the street surface suggests to Dr. Leone a surprising aspect of the practices of slaves at the time. In previous explorations, material remains of African-related religion were almost always found buried in backyards or hidden under hearths and in basement corners. Early African-Americans seemed to practice their spirit rituals in secret. A close examination, Dr. Leone said, showed that the bundle was probably originally placed in the gutter alongside the street, in the open for all to see. At the time the street was paved with logs and sawdust and only later covered with modern surfaces, burying the bundle.